Last evening we had some friends to dinner. Everything we ate, except some goat’s cheese was from the garden. It was a beautiful evening with an amazing sunset and a full moon. 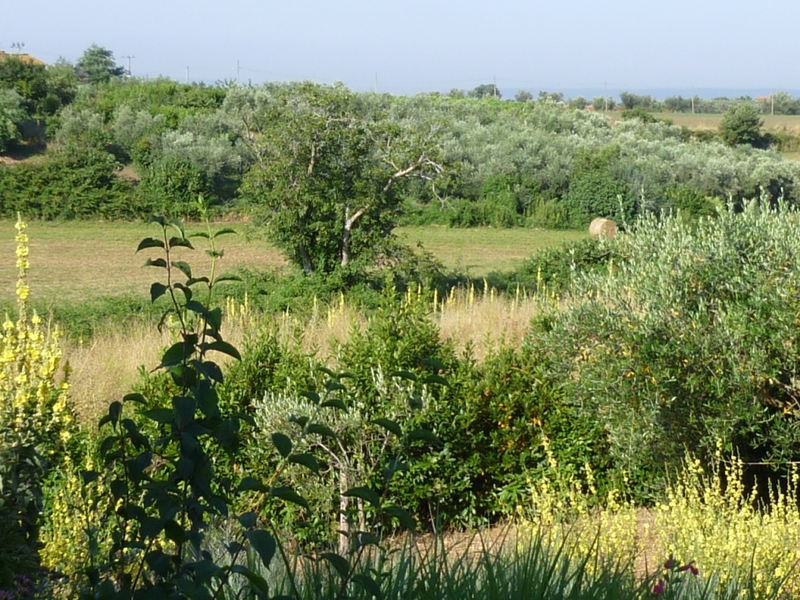 The air was very clear as the Tramontana wind had been blowing all day, it abated while we were eating but blow all night and is howling around the house as I write. There were lots of clouds which threatened rain, but they only made the sky more beautiful. 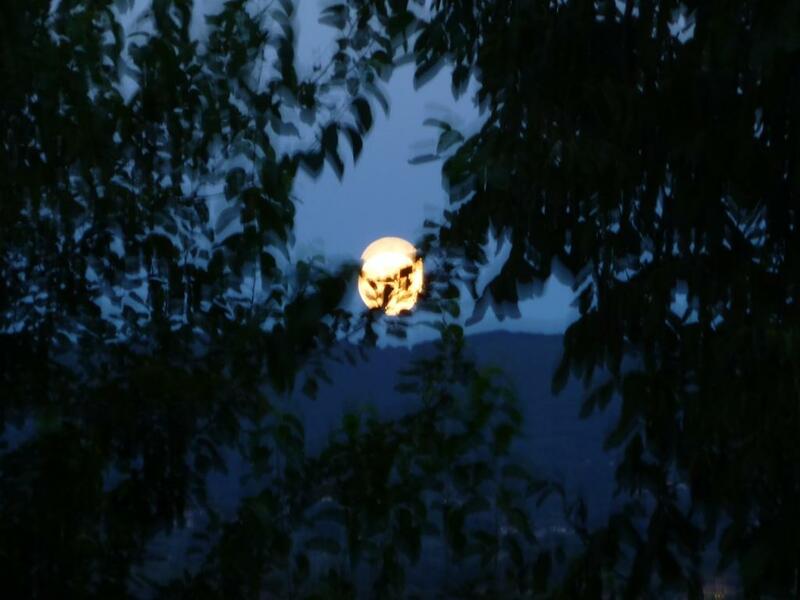 My photo of the moon is not entirely in focus but I like it anyway. We began with roasted peppers. This recipe is quite simply stunning: hard to imagine how something so easily prepared can taste so good. This recipe has appeared in numerous English recipe books (including Delia Smith’s Summer Collection and Elizabeth David’s Italian Food, and has been served at some of the best restaurants in the UK (including The Walnut Tree near Abergavenny, where I had it the first time and Bibendum in London) Some recipes manage to keep their integrity even when they have been copied and appeared in print many times. So I am very happy to share it with you. Cut the peppers in half and remove the seeds but leaving the stalks intact (they’re not edible but they do look attractive and they help the pepper halves to keep their shape). 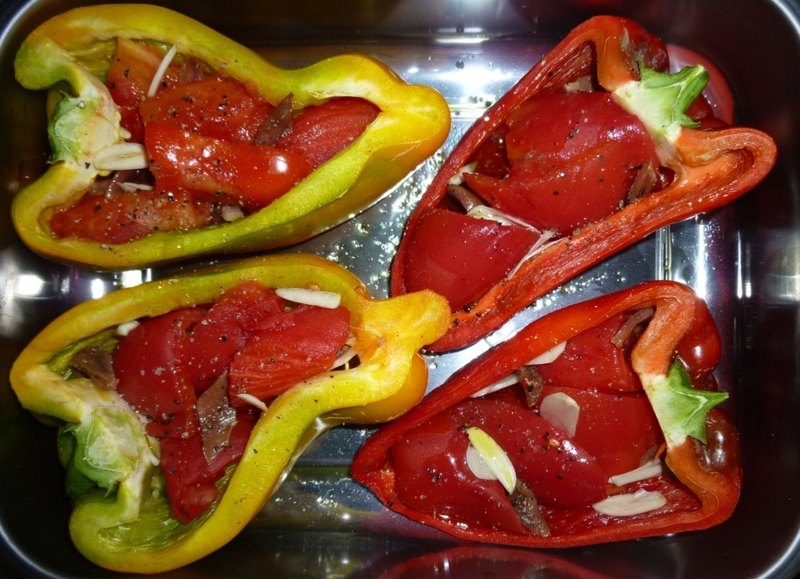 Lay the pepper halves in a lightly oiled roasting-tray. Put the tomatoes in a bowl and pour boiling water over them. Leave them for 1 minute, then drain them and slip the skins off, using a cloth to protect your hands. Then cut the tomatoes in quarters and place two quarters in each pepper half. Then transfer the cooked peppers to a serving-dish, with all the precious juices poured over, and garnish with a few scattered basil leaves. I served this with some home made bread. As it had been such a hot day and I knew my guests very well, the meal was very light. In Italy Sunday lunch is usually a huge meal so that if you invite people Sunday evening the meal is usually lighter. I then grilled some goat’s cheese from mu local producer and served that on a bed of salad leaves with pacchino tomatoes and cucumber on the side. I drizzled the top with olive oil (sometimes I use walnut oil with goat’s cheese) and a little pomegranate molasses. For dessert there was panncotta with raspberry coulis and a few raspberries and blackberries to garnish. 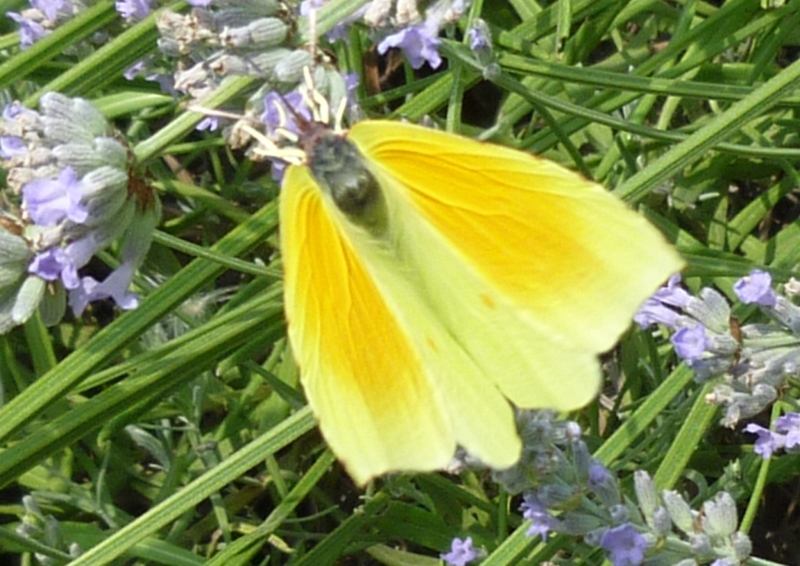 Butterflies, a fox and a recipe! 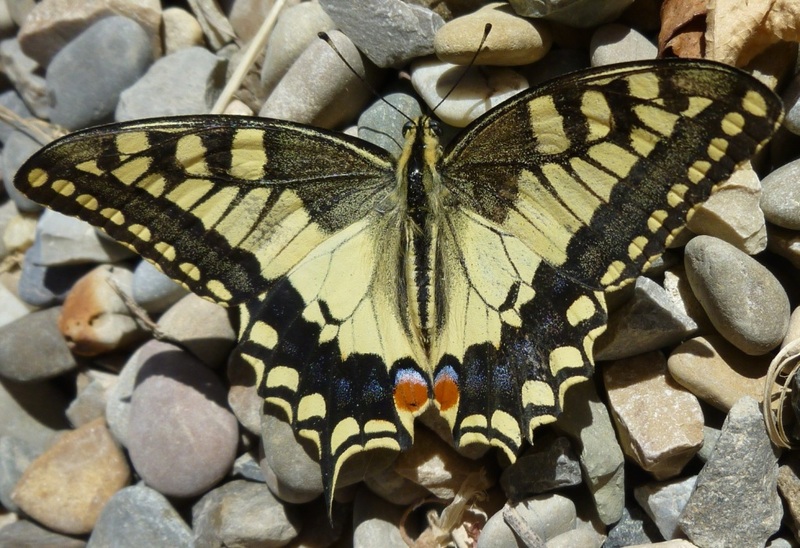 This is the other kind of swallowtail butterfly in my garden, it is not as proliffic as the other scarce swallowtail I posted earlier. 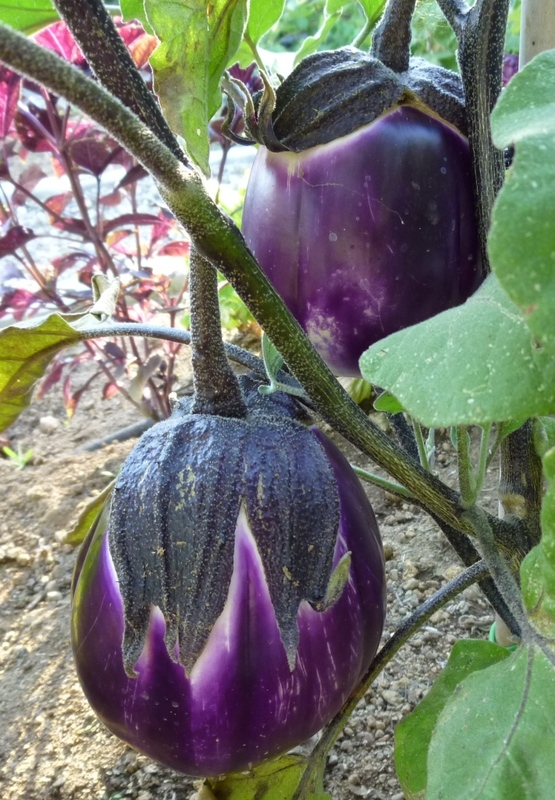 I have begun to harvest my aubergines; they are so wonderfully hard and shiny when I pick them. There are so many ways to prepare and cook them and they taste really different in every dish so I never tire of them. 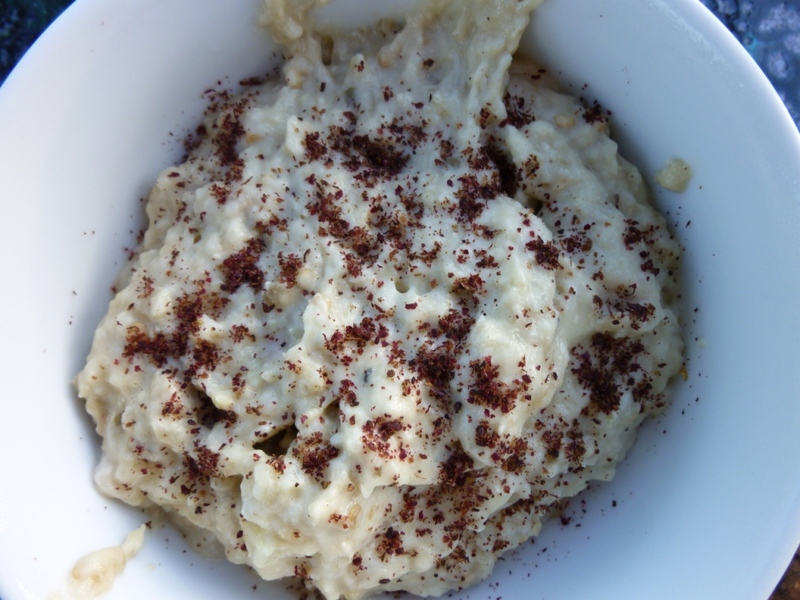 Here is my recipe for Baba ghanoush. Piece the skins of the aubergines to prevent them exploding and grill whole over a hot barbeque (you can do this directly on the naked flame of a gas hob, or under the grill) until the skin is charred and crispy all over and the flesh is very soft. You can also cook it in a very hot oven 220° C for 45 – 60 minutes but the result won’t be so deliciously smoky. When cool enough to handle, discard the tops and peel off the skin, scraping the flesh from the back of the skin. Place in a food processor. Add the other ingredients and blend quickly, I like a chunky texture so I do this for a very short time. Season to taste with the salt and pepper. When I have some I like to sprinkle the top with ground sumac but this is not widely available and not necessary. Serve with toast, bruschetta or more traditionally flatbread. Something has been digging in the garden for the last few weeks and I hadn’t been able to work out what it was, then last week I was looking out of my studio window and I saw something moving under the mulberry tree; what was it? A cat? – no, a dog? – no – it was a fox, a little different to the English foxes I’m familiar with, not so red with longer sleeker legs and a dark tan colour but still unmistakably a fox. One evening he came close to me while I was eating supper outside, he looked at me, for some minutes, as if I were the intruder in his garden, then moved a short distance away, checking me out again, then decided to turn and run. Since then I’ve seen him (I don’t know why I think it’s a male) most days. I know,now, where he’s coming in, so this weekend is when the hole gets filled and the fence strengthened! Sorry so far no photo! 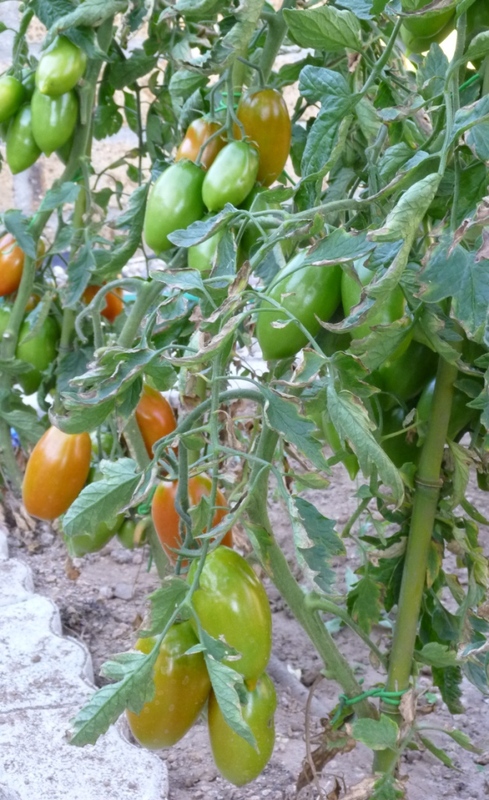 At the end of last week I picked a huge quantity of cooking tomatoes and I’ve been picking salad, beefsteak and small tomatoes every day. Several days lunch has been Caprese salad with good homemade focchacia and maybe a few olives. 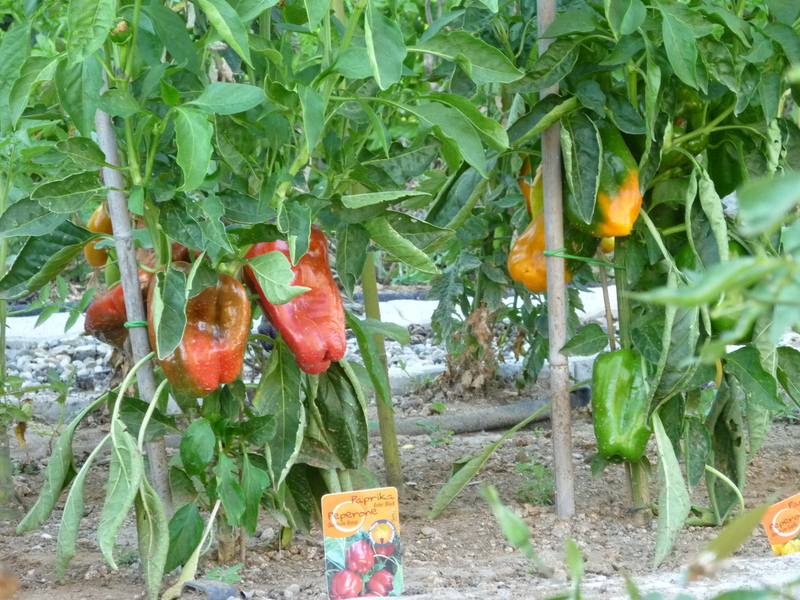 The grafted San Marzano tomato hasn’t produced fruit quicker than the other ordinary plants so I wouldn’t worry to buy that again; but the peppers are certainly worth it as everyone told me I wouldn’t get any red or yellow peppers. 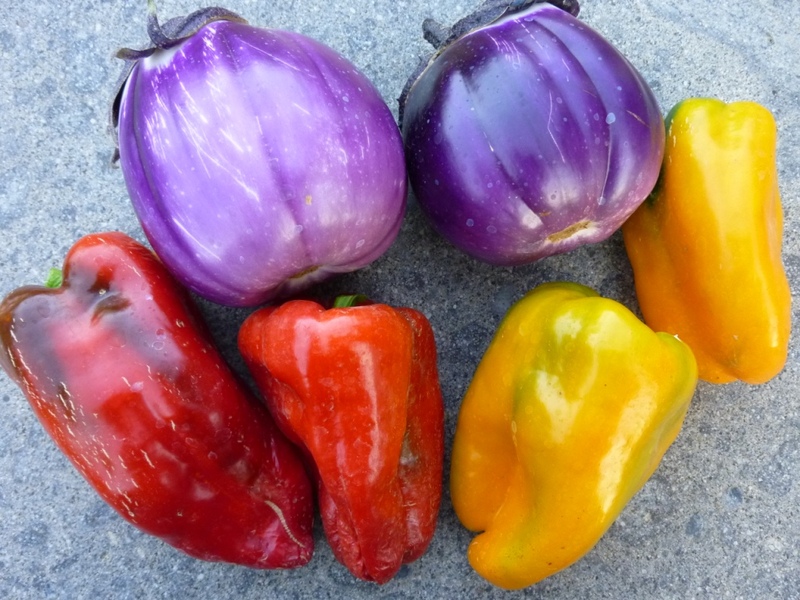 I harvested the first 2 melanzane (aubergines) and my very first ever peppers. I cooked them by simply grilling them on the barbeque along with a couple of overgrown zucchini (courettes) – they need to be a big larger to grill so at least there is something to do with the ones that seem to hide until there’s too big. I’m picking roughly one cucumber per plant every day, there’s six plants so obviously I have too many! They aren’t as good to eat as last year’s, I seem to remember there’s something about male and female plants, but I don’t remember the details I need to look it up. If you have any good recipes for cucumbers I would be very grateful. I’m still picking raspberries but not at the same rate. My cultivated blackberries are beginning to fruit but only a few each day. The garlic are now plaited together as are most of the onions; the red onions are still growing, but very slowly, they’ll be small but good for mixing with other vegetables and roasting them in a hot oven for a tasty ratatouille. This morning (bad time, should be evening) I planted some broccoli, romanesco, more lettuces and some small beetroot plants. I have some fennel plants too which need to go in. I’ve also just planted a few more tomatoes which I’m promised will take us into October with fresh, ripe tomatoes. I’ve pinched out the tops on those that have reached the top of the canes; this usually means they have produced about 7 or 8 trusses. 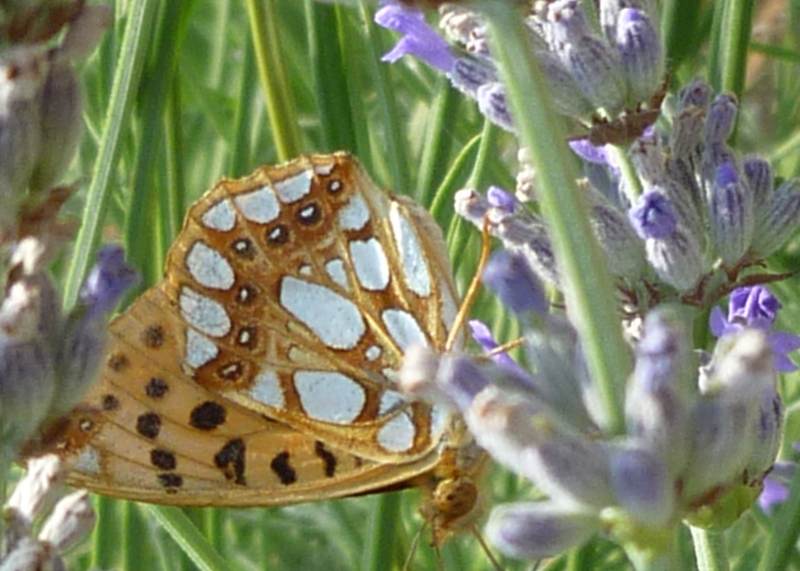 Above: either High Brown Fritillary (Fabriciana adippe) or Queen or Spain Fritillary (Issoria lathonia). Until I planted this garden I had never seen so many different types of bees and wasps; it is the sound of all the insects, busy collecting nectar and pollinating the flowers, that tells me things are in harmony. 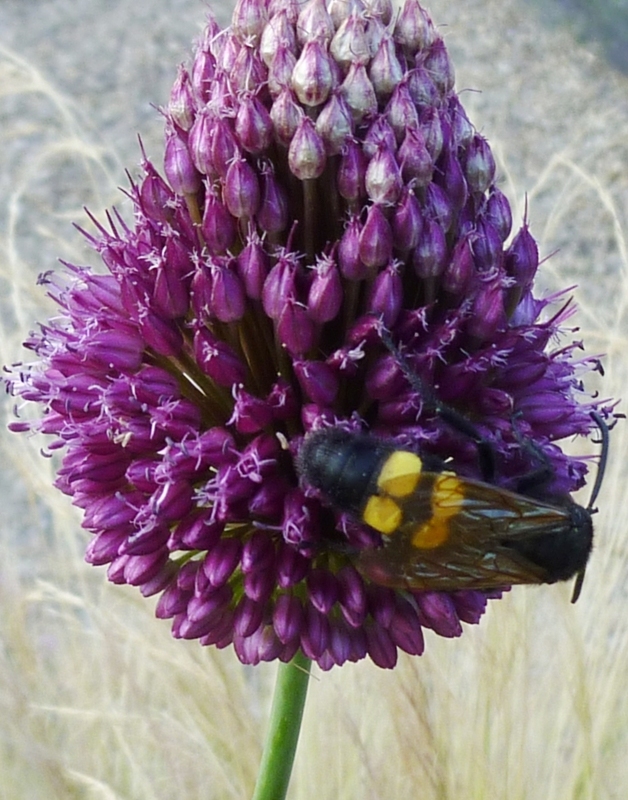 This wasp relative (Scolia flavifrons) came to the garden solely for the nectar of Allium sphaerocephalon, then disappeared. Most of my plants attract many insects, so much so that an entomologist friend has set up a research project to assess just how many insects are visiting the garden; when he has completed his initial research I’ll be able to give you a list. 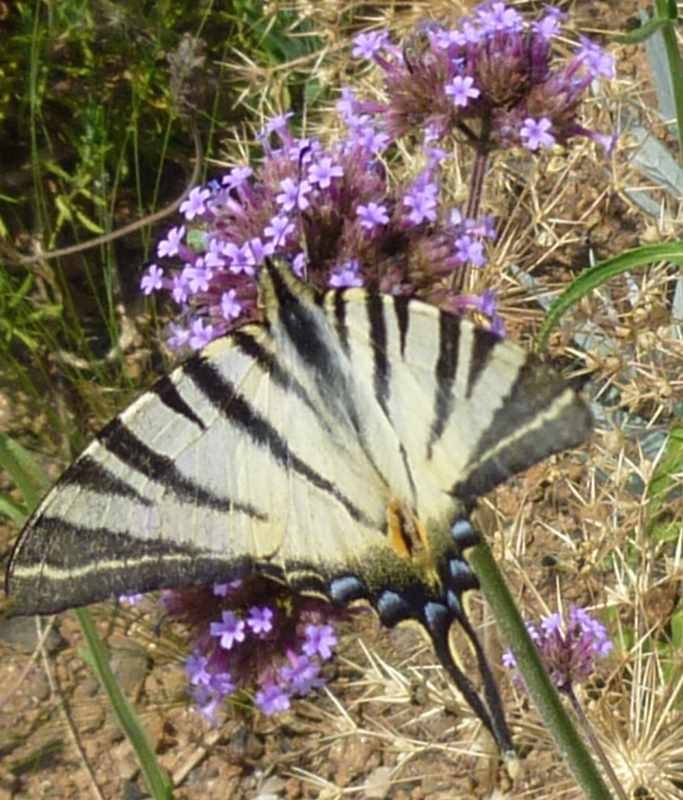 I enjoy all the butterflies, even those I haven’t managed to photograph, perhaps the Scarce Swallowtail (Iphiclides podalirius) gives me most pleasure as it seems so exotic- though it isn’t as rare as its name implies. 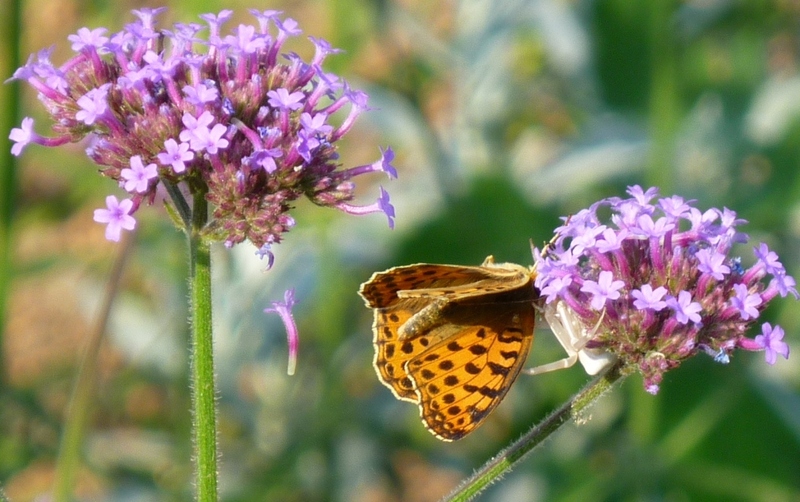 Perched on the flower-head of Verbena bonariensis, the plant it favours most, it looks so elegant. 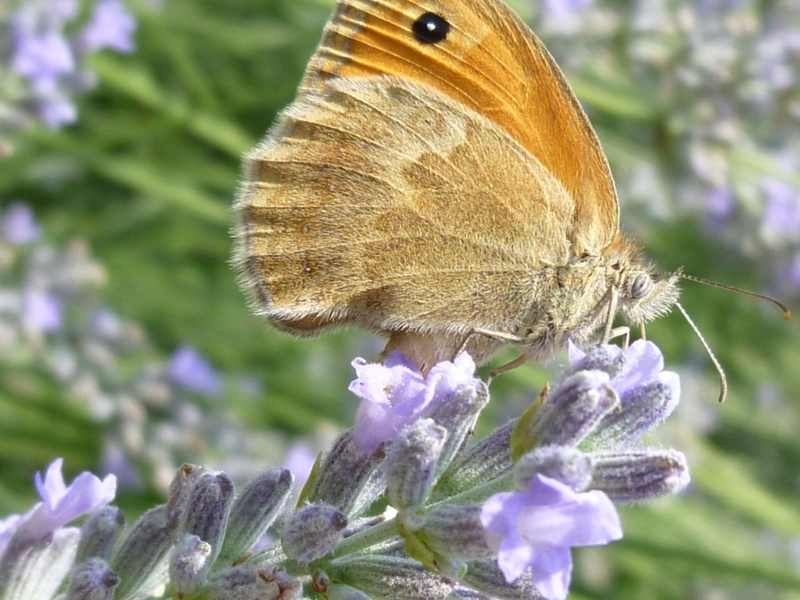 Most of my plants attract many insects, so much so that an entomologist friend has set up a research project to access just how many insects are visiting the garden; when he has completed his initial research I’ll be able to give you a list. I never realised just how difficult it is to photograph insects; just as you think you have a good shot, the subject flies to another flower. We are lucky to have a female Little Owl (Athene noctua) who has raised her young on our roof every year. Last weekend we saw the first flight of this year’s chick. During the night we hear the distinctive sound of the chick asking for food. We also watched the first tentative flight or two young Kestrels (Falco tinnunculus) who have taken up residence in a tree by a neighbouring farmhouse. Last year a Buzzard perched on a fence post for about 20 minutes while I watched too fascinated to get the camera. Lizards rush crazily about, chasing each other in the heat of the day; their ability to climb astounds me; while I was tying in the Wisteria on the top of the pergola I was momentarily scared by the noise of an animal which turned out to be a couple or lizards ‘playing’. According to myth the garden of the Hesperides was guarded by the dragon, Ladon. I don’t have a dragon but the lizards look like small dragons to me so I feel that they guard my garden. There are snakes too, at least two large Western Whip Snakes (Coluber viridiflavus) and grass snakes (Natrix natrix). 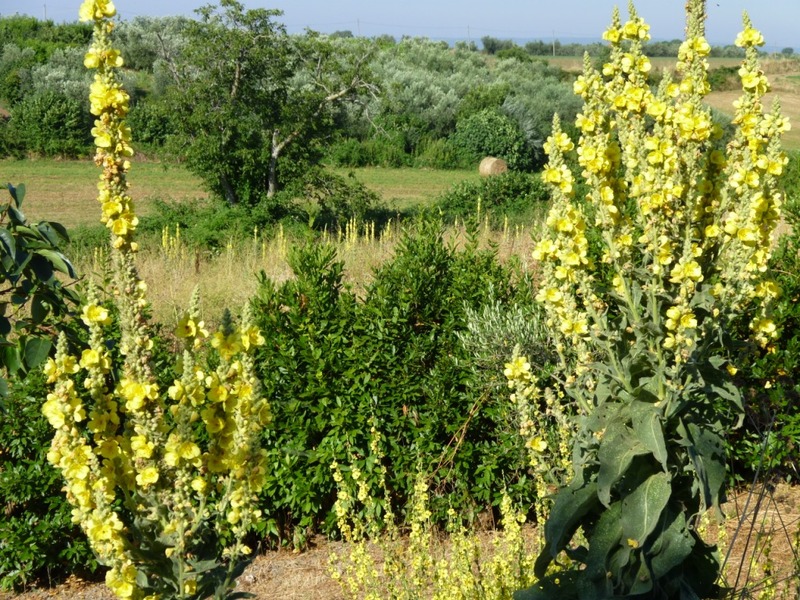 Yesterday I mentioned how the self seeded Verbascums linked the garden into the wider countryside. Ecco! 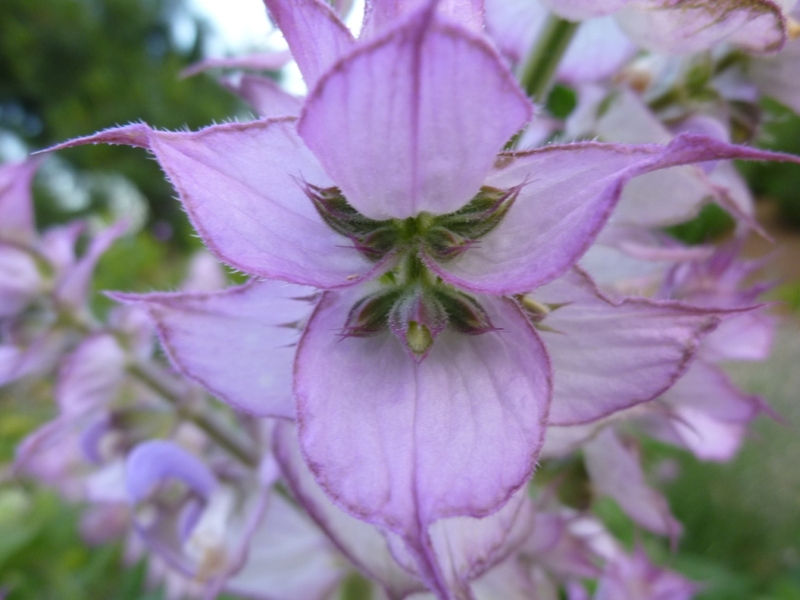 This is just one stem – seems impossible that so many flowers can be produced as one flower head and be so large. 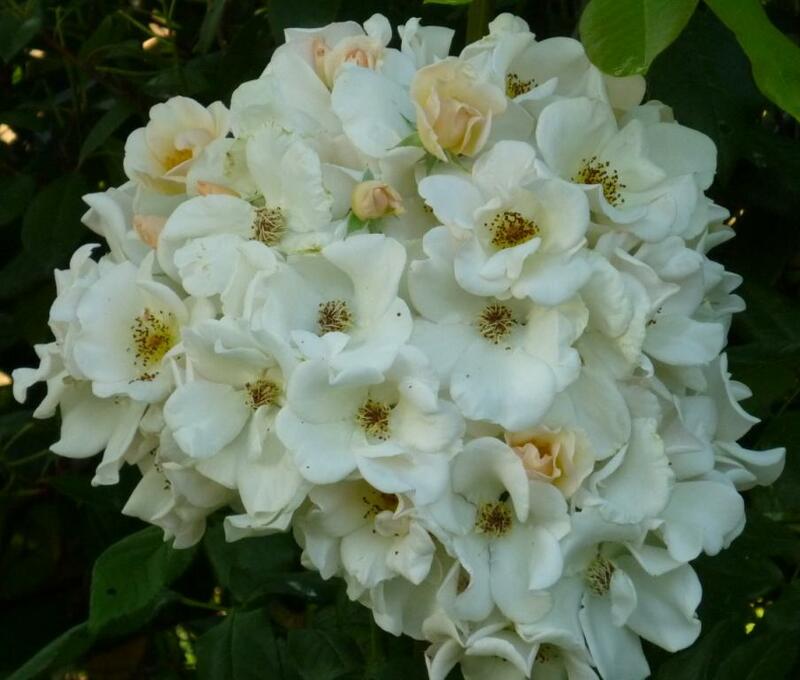 This rose was planted as a small cutting just over two years ago; it is already approaching 1.8 metres high with a spread of about the same. Plants that self seed are telling you that you’re doing something right, the plant is happy with the conditions and wants to create drifts for you. 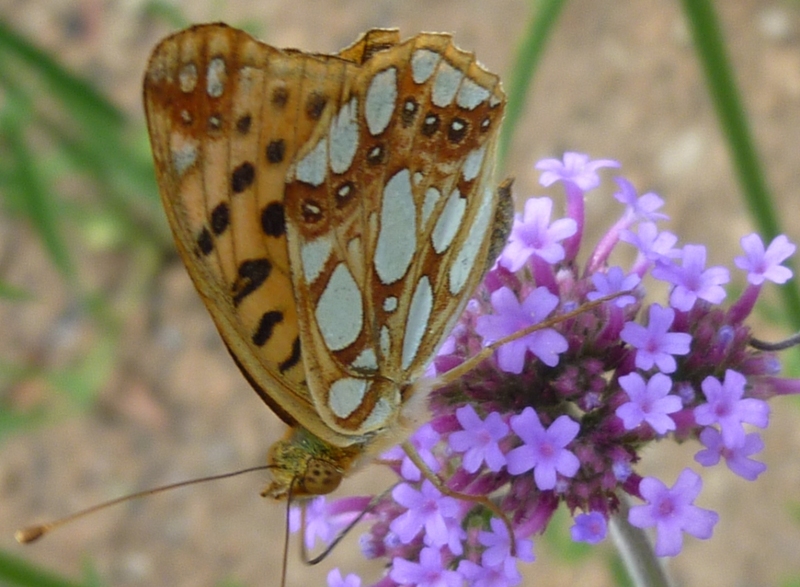 Verbena bonariensis is a case in point. 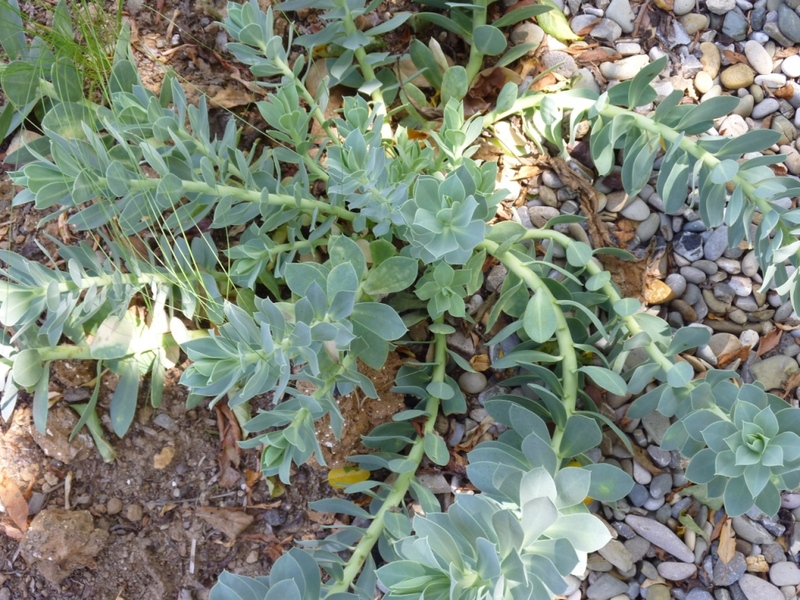 I love it – it loves my garden, it self seeds to form positive forests, if they’re in the wrong place I just pull them up for the compost heap or give them to grateful friends. 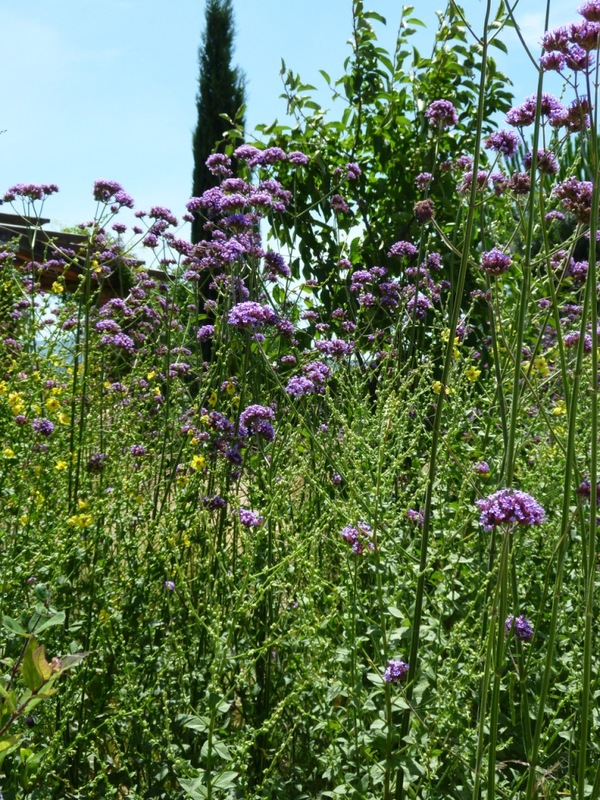 Some self seeders become by their very nature the signature plants of the garden; Verbena is one of these as is stipa tenuissima. 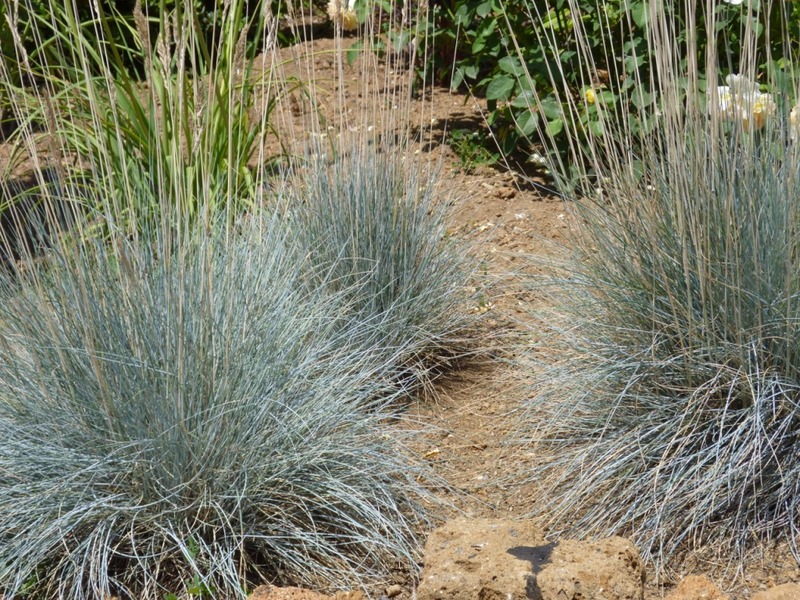 Another signature plant (always planted in groups of three) that adds rhythm to the garden is Festuca glauca. Sadly this doesn’t self seed as much as I would like but it is supplying me, slowly with the plants I need. 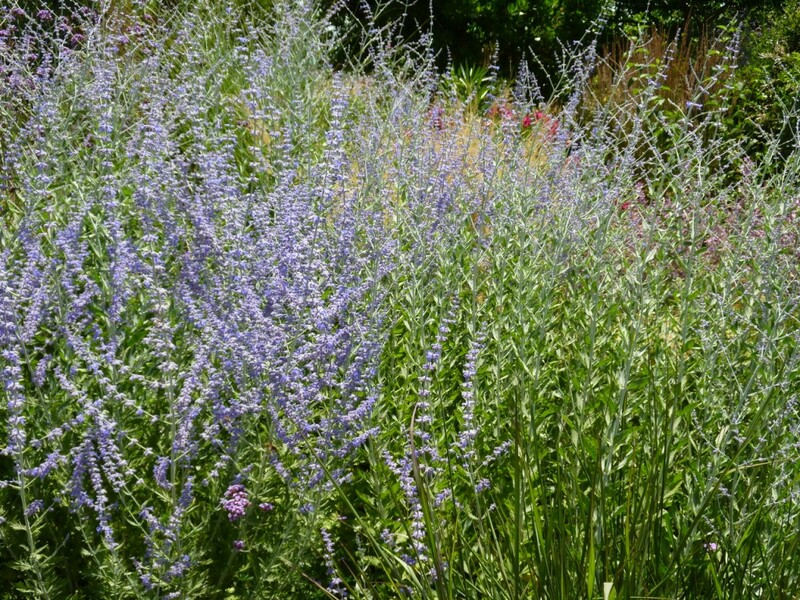 As there are so many Perovskia planted in the central formal beds there are bound to be lots of seedlings from these. 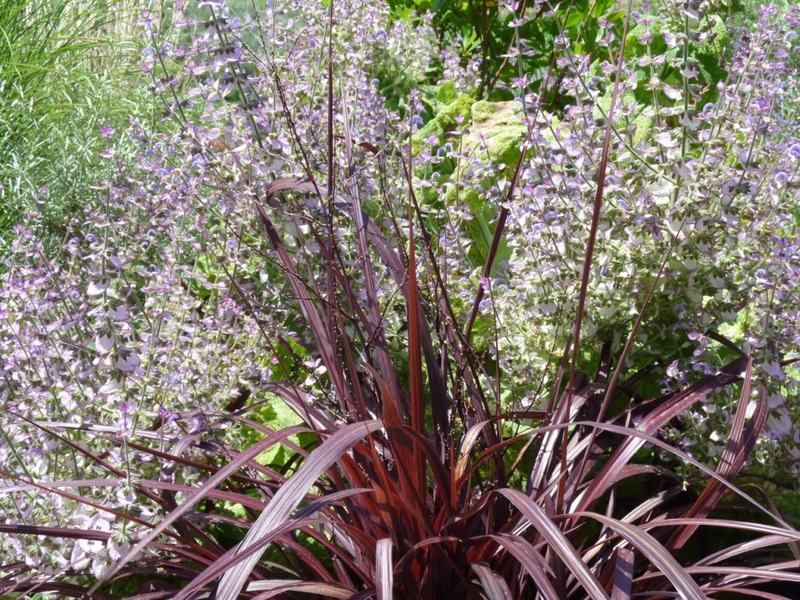 I’m using them to give colour in new areas of the garden as a pioneer plant, I may pull them out later if I find something I like better for these new areas. Some seeds have blown in from the surrounding fields (along with weeds of course). 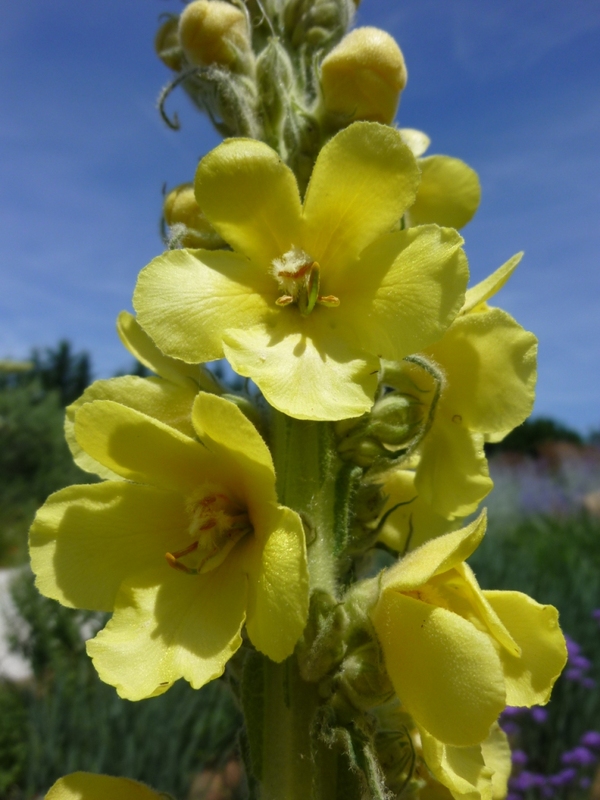 Verbascum olympicum gives another strong upright, I will allow more of these to self seed, even though their basal leaves are quite ugly. They march in a stately manner across the neighbouring field. 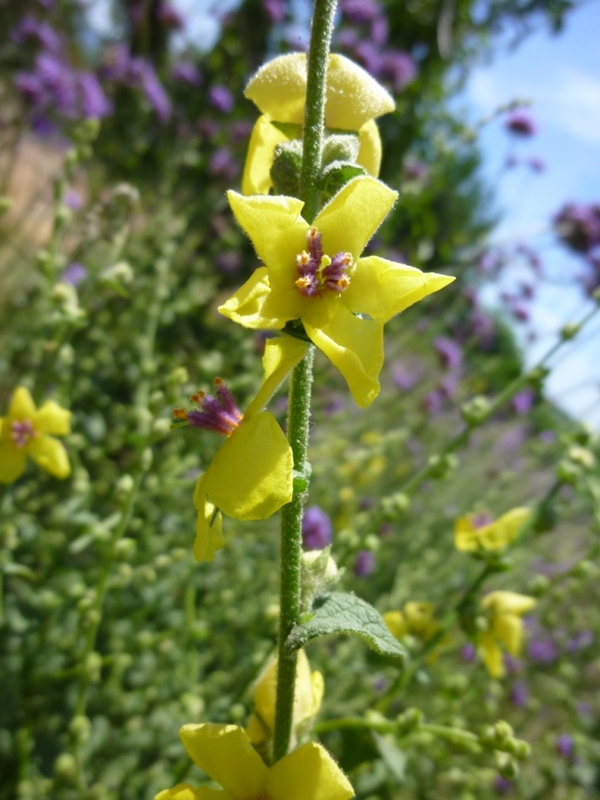 A verbascum chaixii look alike is along all the road verges and has put itself beautifully next to Verbena bonariensis giving a strong contrast of colours I probably wouldn’t have thought of doing. 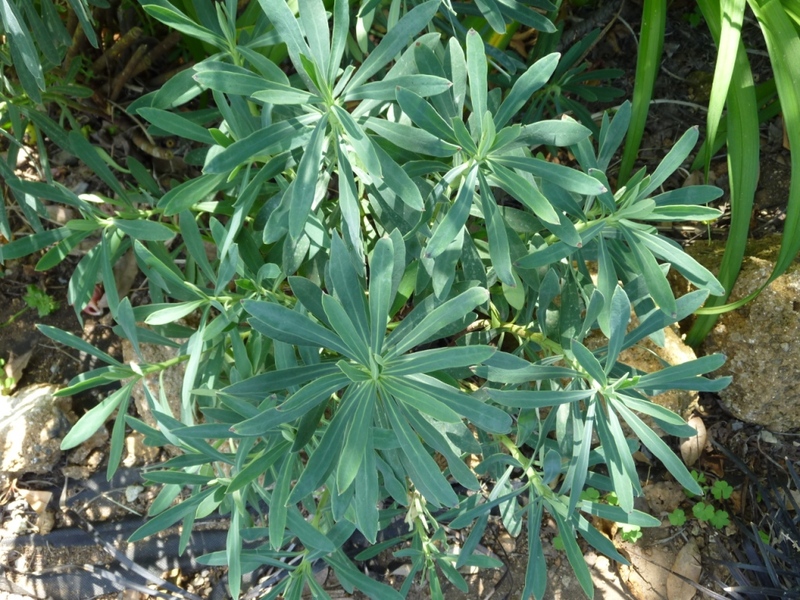 I grew Euphorbia myrsinites and E. griffithii from seed originally and they seed themselves happily and are very tolerant of being moved into what I consider more suitable places. I gratefully accepted a small plant Salvia turkestanica when I began my garden, and when there was lots of empty space I enjoyed its exuberant growth; when I found some seedlings the following year I was pleased and moved them to where I hoped they would be useful; I even gave them some water last year to help them grow! This year there were four huge plants. 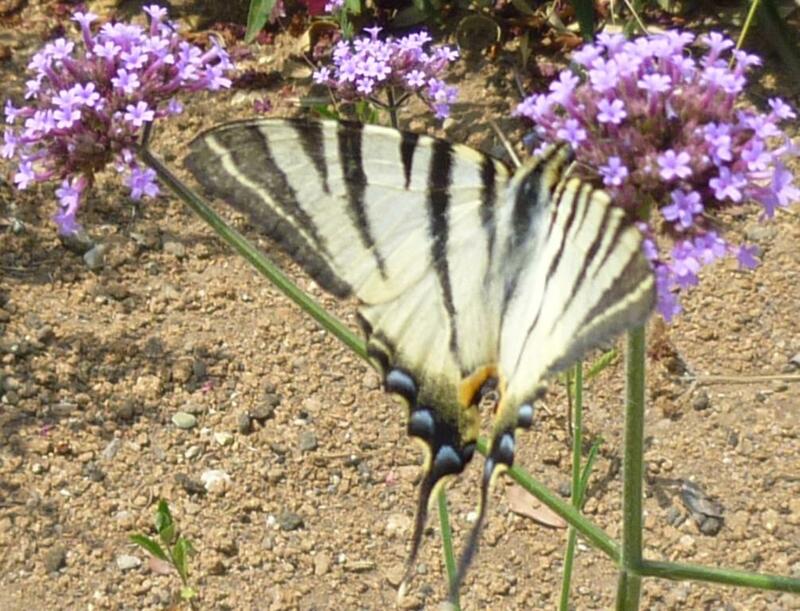 They were beautiful for a while, but then some of them sprawled over a path and if you allowed them to touch you they imparted their unpleasant odour (not for nothing is their common name ‘housemaids’ armpits’). So next year when I find seedlings I hope I’ll remember that I needed a shower every time I touched them and that the whole garden smelled horrendous when I pulled them out and I treat them like weeds. An interesting fact is that until they flowered the leaves had no smell what-so-ever; I even doubted they really were Salvia turkestanica!